JOSH WARRINGTON INSISTS that nobody should be fooled by the pleasantries exchanged by himself and Carl Frampton on the recent media tour because he is fully prepared to break the pain barrier in order to defend his world title and become No.1 at Christmas. The three-city whistle-stop promotional trip to highlight the IBF world featherweight title defence between holder Warrington and two-weight world champion Frampton was notable for the respectful rhetoric between the two fighters. The build-up to Warrington’s title winning encounter against then champion Lee Selby in May was a spikey affair as a result of a feud that had developed between the pair from when a fight was originally mooted. The just turned 28-year-old Leeds man states that the niceties will not stand the test of time when the two reach the business end of their association. “Listen, don’t get it twisted, we are going in there to hurt each other and I am willing to die to defend my belt because it means that much to me,” said the 27-0 champion, who went on to outline his intentions post-Frampton. “I want to give it all to take it home with me again and that is what I’m going to do. “This is why we have taken the fight so soon, because we beat Carl and I want to go on and unify the division. 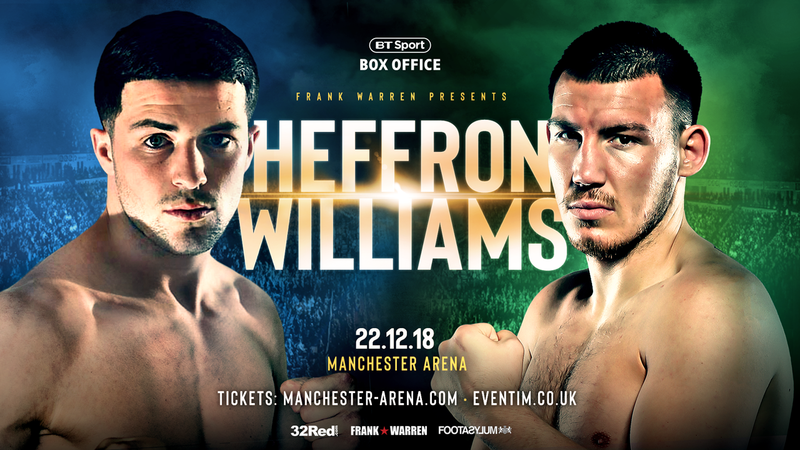 THE THRILLING PROSPECT of Mark Heffron taking on Liam Williams is to become a reality at the Manchester Arena on December 22, live on BT Sport Box Office. Heffron, 21-0 (17KOs) and Williams, 18-2-1 (13KOs), collide on the undercard of Josh Warrington defending his IBF world featherweight title against Carl Frampton in what is certain to be an absolute barnstormer of a fight. The match-up between the WBC International middleweight champion – and mandatory challenger for the British title – and the former British and WBO European super welterweight champion has come about due to the withdrawal of the originally scheduled opponents. Heffron was due to challenge the British champion Jason Welborn, who subsequently vacated the title, while Williams was due to fight JJ Metcalf for the WBC International belt. Metcalf has pulled out of the fight due to injury. There was no willingness amongst middleweight rivals to replace Welborn and oppose Heffron for the Lonsdale belt, but Williams has no issues over trying his hand at the higher weight against such a dangerous operator. There is a history behind the match, with Heffron’s brother Ronnie suffering his only career defeat to Williams back in July 2014. The former standout amateur and highly-rated prospect was retired in the sixth round with a severe cut to the head and has not fought since. “It is going to be some fight for me now on December 22 and it is one I am looking forward to as well,” said Heffron of the explosive match-up. “It is definitely a bigger fight than I had lined up before and it is one that will move me onto massive titles afterwards. “Credit to Williams for stepping up when nobody else wanted to and he is also coming up from light middleweight. Give him his due for that. “He is a big light middle though with a big back and very strong, so there shouldn’t be much between us when it comes to size. “It is a fight that has got thriller written all over it and the idea of hitting and not getting hit will go out of the window fairly quickly. Like Heffron, Williams believes he now faces a greater challenge than he was previously anticipating. “One hundred per cent it is a bigger fight than I had lined up before – it is a cracking fight,” said the Welshman known as the ‘Machine’. “What can I say other than it excites me. It gives me the chance to prove myself at the weight above as well and I should say that I am not being forced to move up because I can make light middle and will still make it. “It is just an opportunity that has come to me because that bottle-job Metcalf pulled out again. “Listen, I respect Mark Heffron, he is a quality fighter who can punch and box. I believe I can beat him and if I didn’t I wouldn’t have taken this fight and moved up a weight to take it. 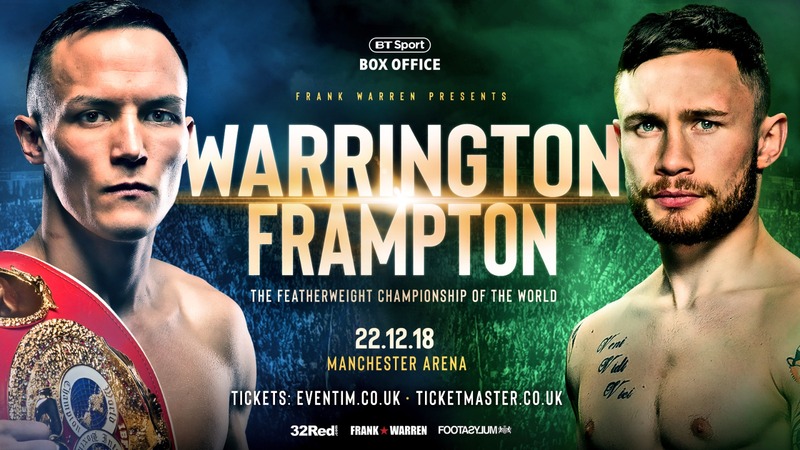 IBF world featherweight champion Josh Warrington takes on former two-weight world champion Carl Frampton at the Manchester Arena on December 22nd live on BT Sport Box Office. Mark Heffron will now fight WBO Interim world title challenger Liam Williams in support of the main event, while Belfast’s blue chip featherweight prospect Michael Conlan (9-0) will also feature on the bill along with world flyweight title challenger Paddy Barnes (5-1) and unbeaten Light Heavyweight contender Steven Ward (9-0). JOSH WARRINGTON is dreaming of hitting the boxing jackpot in Las Vegas so his friends can have a week of partying. The Leeds hero defends his IBF World Featherweight title against Belfast’s Carl Frampton (26-1) at Manchester Arena on December 22. Promoter Frank Warren is lining up a unification fight next year against WBO champion Oscar Valdez for the winner. If Warrington wins his first defence next month he wants it to take place in America. Warrington (27-0) is a huge ticket seller and would take thousands of fans if he boxed in the world’s boxing capital. He said: “I would like to go to the United States – that gets me excited! “It is for all my fans. After I beat Lee Selby, they were all asking me; ‘When is Las Vegas happening?’ They want an away day and an excuse to take a holiday..
“My boxing bucket list is unifying the division and to box there like a lot of the great fighters have. Valdez says he wants the Warrington/Frampton winner and his promoter Bob Arum has discussed the clash with Warren, who promotes both boxers. Warrington, 27, added: “Valdez is very exciting, a helluva talent, likes a scrap, known how to get guys out when they’re hurt but at the same time I have seen weaknesses. “He gets caught pretty clean and sometimes uses his chin as his defence. He has beaten good names though and I wouldn’t take any credit away from him. Warrington is still young enough to take his time in cleaning up the Featherweight division, but is in a rush to secure his legacy. he explained. “I am reaching my peak years. I’m fresh, I’m hungry, I’m determined. When you have momentum and confidence in yourself go for the big ones. “Some fighters look at it like they have a chance to pad out their record and get some paydays under their belt. “It is a short career and I don’t want to be boxing forever. If I can get the big fights one after the other I will take them. “In my mid-career I was headlining Leeds Arena and I wasn’t fighting big names, but I was building myself up. IBF world featherweight champion Josh Warrington takes on former two-weight world champion Carl Frampton at the Manchester Arena on December 22nd live on BT Sport Box Office. JJ Metcalf will defend his WBC International super-welterweight title against Liam Williams in support of the main event, while Mark Heffron will challenge for the British middleweight title. 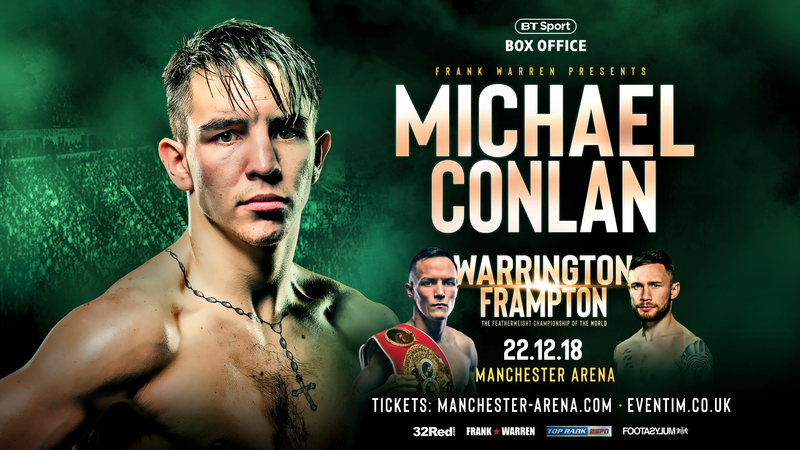 MICHAEL CONLAN has two jobs in one night next month – making it a perfect ten as a professional and gathering some intelligence on possible future opponent, Josh Warrington.Conlan (9-0) boxes on the undercard when Warrington (27-0) risks his IBF Featherweight crown against Carl Frampton (26-1) at Manchester Arena on December 22. Belfast’s Conlan is widely expected to fight for a world title inside 18 months, but it won’t be against Frampton because they are close friends. Warrington is in his firing line.Conlan said: “A fight against Josh is something I can see happening and it is going to be some fight between him and Carl. “Another reason that I’m intrigued in the fight is that it’s a scouting mission for me. “Win or lose, I would love to face Josh Warrington in the future. Carl and myself are friends so that won’t happen, but I am definitely keeping an eye on Josh. Conlan’s promoters Top Rank are steadily moving him up in class and by this time next year he’s likely to be fighting top operators like Warrington. The 2015 world amateur champion added: “I would feel confident even though I rate Josh as a fighter. His style is one I love to face and one that brings out the best in my style of boxing. 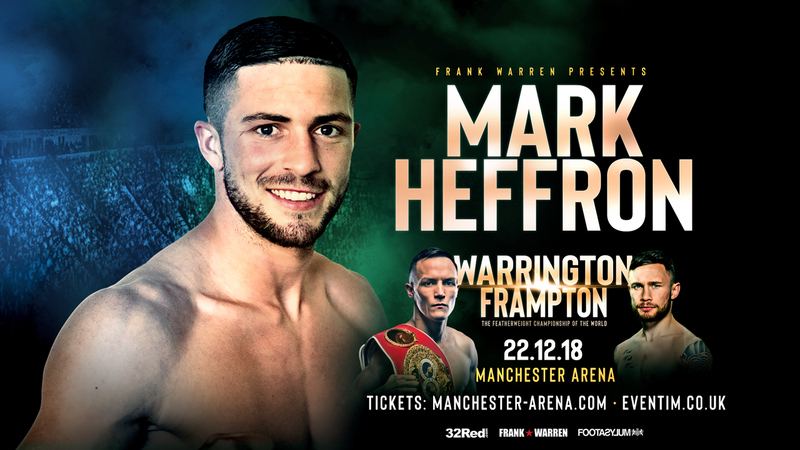 MARK HEFFRON ADMITS to being a little bemused over the apparent lack of enthusiasm amongst his middleweight rivals to step up and contest the British title against him. The unbeaten knockout artist worked his way into mandatory position for a shot at the belt with a string of impressive victories and he was all set to take on the champion, Jason Welborn, who was fresh of a double over Tommy Langford. The Manchester match-up was then aborted after purse bids had been won for Heffron to challenge for the title on the big Josh Warrington-Carl Frampton card on December 22. It transpired that Welborn had understandably accepted a world title opportunity on December 1 against Jarrett Hurd on the undercard of Deontay Wilder-Tyson Fury, but the development was still a blow to the ambitious Heffron. “I was pretty gutted that Welborn vacated the title, but obviously he has got a big opportunity,” said the 21-0 man known as ‘Kid Dynamite’. “I knew straight away that he had vacated to fight for the world title because my manager rang me, but I was still gutted although I understand it. Heffron will still fight for the coveted Lonsdale belt at the Manchester Arena if a contender steps up to the plate and accepts the challenge. However, at the moment, willing volunteers are not queuing up around the corner. “We’ve had a few names thrown at us to fight for the vacant title and every name we have said yes to, but the people it has been offered to have come back and said they don’t want the fight, so it is a bit hard work at the minute. “I can’t understand it, can I ‘eck, because if someone offered me the chance to fight for the British title I would grab it with both hands, which I obviously have done anyway. “Reece Cartwright got offered it and then came back not wanting it, but I don’t know for what reason, while I think Tommy Langford was asked and he is moving up a weight. “It has now got back to me about Conrad Cummings as well and he has not taken it either. I think he has got something else going on. “I just need somebody to come forward and take the fight now. MICHAEL CONLAN has spoken of his concern for the future of amateur boxing if the sport is expelled from the 2020 Olympics.The Belfast Featherweight prospect was involved in one of Olympic boxing’s biggest ever controversies at the 2016 Rio Games. He was tipped to win 56kg gold, but was the victim of a points defeat against Russian Vladimir Nikitin in the quarter-finals when he looked a clear winner. Conlan famously gave a middle finger salute to AIBA judges officiating and then turned pro with American powerhouse promoters Top Rank.Conlan (9-0) is on a collision course to face Nikitin next year, but is in action at Manchester Arena on December 22 when his friend Carl Frampton challenges IBF Featherweight champion Josh Warrington, live on BT Sport Box Office. A row has broken out over the governance of the amateur sport putting its Olympic future under threat and fears have risen after Gafur Rakhimov was elected AIBA President.Conlan, 26, said: “Boxing is en-route to being kicked out of the Olympics which is very, very unfortunate and something I would not like to see. “I think Olympic boxing is the main reason so many boxers stay amateur. The only reason I stayed amateur for so long is because I wanted to be an Olympic champion. “If boxing get kicked out it will be really unfortunate and you will see a lot of young amateurs turn professional. “The only people I am sorry for is the boxers who are going to miss out on a chance to become an Olympic champion and experience that. “I feel bad for them because they have the Olympic dream and want to be successful. “If they can’t get a chance of going to the Olympics there is no point in staying amateur in my opinion. Belfast’s blue chip featherweight prospect Michael Conlan (9-0) also features on the bill along with world flyweight title challenger Paddy Barnes (5-1) and unbeaten Light Heavyweight contender Steven Ward (9-0). Tickets are priced at £50 Upper Tier, £80 Tier, £100 Tier, £150 Tier, £200 Floor/Tier, £300 Floor, £400 Floor, £600 Inner Ring VIP Hospitality and are available. LEGENDARY fight promoter Bob Arum believes Josh Warrington and Carl Frampton’s blockbuster battle will live up to expectations.Warrington’s first defence of his IBF featherweight title at Manchester Arena on December 22 is tipped by many experts to be a classic battle. Arum has a huge interest in the fight and is in talks with his friend and fellow promoter Frank Warren to match the winner against his WBO champion, Oscar Valdez next year in a unification. Two-weight world champion Frampton (26-1) has been in brilliant form this year thrashing Nonito Donaire on points and stopping Luke Jackson. Warrington (27-0) caused one of the biggest upsets of 2018 when he snatched his world crown from Lee Selby in May, in front of 25,000 hometown fans in Leeds. So it’s easy to see why Arum expects the BT Sport Box Office clash to deliver for the expected 20,000 fans packed into the arena and armchair viewers. Arum said: “We are looking forward to the Frampton-Warrington fight, which should be a real barnburner. Arum is expected to be ringside sitting alongside Warren in Manchester to see his unbeaten featherweight prospect Michael Conlan box. 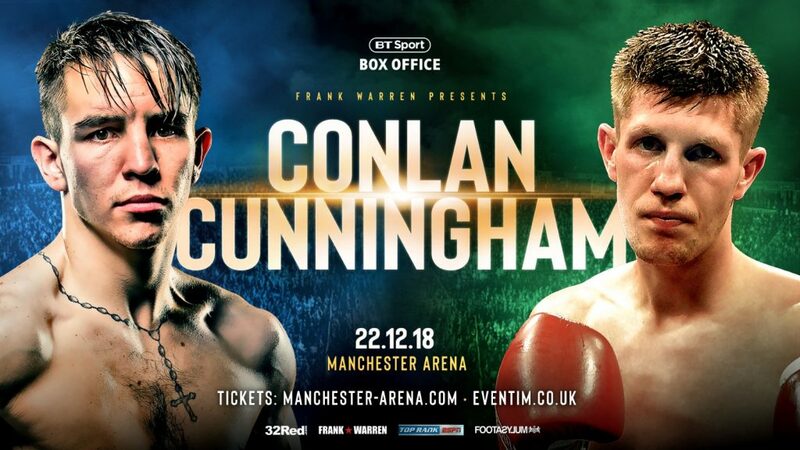 Conlan (9-0) is a close to his fellow Belfast boxer, Frampton and the pair insist they will never fight each other, but he is a possible future rival for Warrington. IT IS HARD to imagine Josh Warrington having any regrets from his epic world title-winning encounter with Lee Selby in May. It was a night when everything clicked perfectly into place for the Leeds Warrior. From the fight being staged inside his footballing place of worship at Elland Road, to the Kaiser Chiefs playing him into the ring in front of a buoyant bumper crowd, to a dominant display that unseated a long-standing world champion.His regrets are not a few – just one – in that he didn’t go for the jugular when he had Selby on the ropes to force a stoppage. Now the IBF world featherweight champion states that he won’t afford Carl Frampton similar leeway when the pair get it on at the Manchester Arena on December 22 in first defence of his title, live on BT Sport Box Office. “It is going to be high octane with plenty of energy in there with two fantastic styles,” considered the 27-year-old champion, talking to BT Sport. “I think the fight might change patterns in terms of feeling each other out and being edgy, then busy in spells, but I can see nothing else than me taking over from the second half. “I don’t like making predictions and I see a Josh Warrington win, but I am going to go for a stoppage this time. If I see it I am going to go for it. JJ Metcalf will defend his WBC International super-welterweight title against Liam Williams in support of the main event, while Mark Heffron will challenge for the British middleweight title.Belfast’s blue chip featherweight prospect Michael Conlan (9-0) also features on the bill along with world flyweight title challenger Paddy Barnes (5-1) and unbeaten Light Heavyweight contender Steven Ward (9-0). Tickets are priced at £50 Upper Tier, £80 Tier, £100 Tier, £150 Tier, £200 Floor/Tier, £300 Floor, £400 Floor, £600 Inner Ring VIP Hospitality and are available.Tickets available via Eventim.